Heroes of Normandie – First Look! Heroes of Normandie is getting all sorts of chatter around the web. What’s in the box? 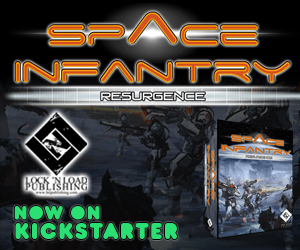 I left Origins 2014 fairly heavily-laden (everybody here is coming to see us Grogheads Central Command this year, right? 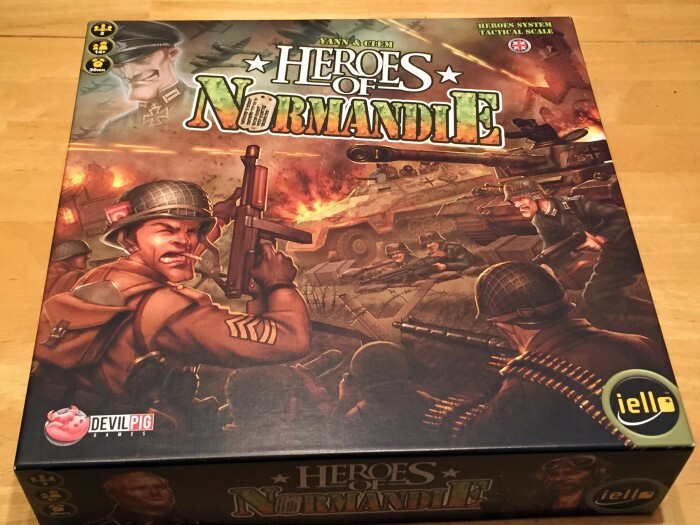 ), but one game I left un-bought was Iello’s “Heroes of Normandie”. I’m a bit of a “Memoir ’44” obsessive, the fact that both my wife and son are willing to play it with me is likely argument sufficient, and the game as laid out on the demo tables at the convention read like a competitor so I spent elsewhere. 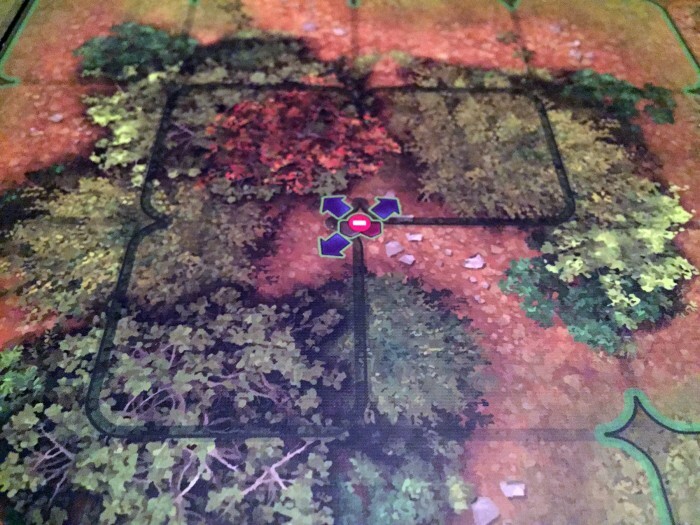 I kept my eye on the game over the year since, though, drawn to its over-the-top graphic style and the representations of some that it played like a simplified miniature game with counters. So, when Amazon included it among its Tabletop Day sales items, I pulled the trigger. What follows is a bit of what’s inside. Like I said, the box and everything within is, let’s say, dramatic. 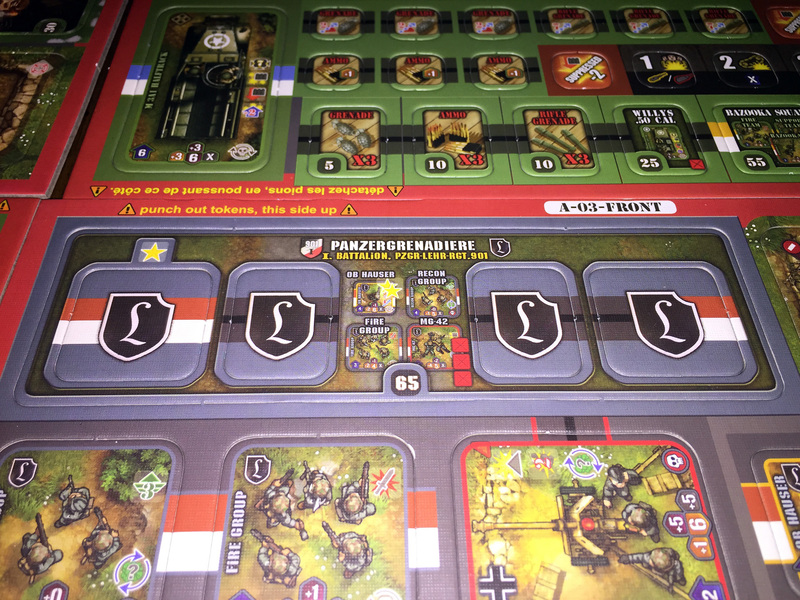 For this the game makes no apologies saying that this is World War II as fought in classic war films. 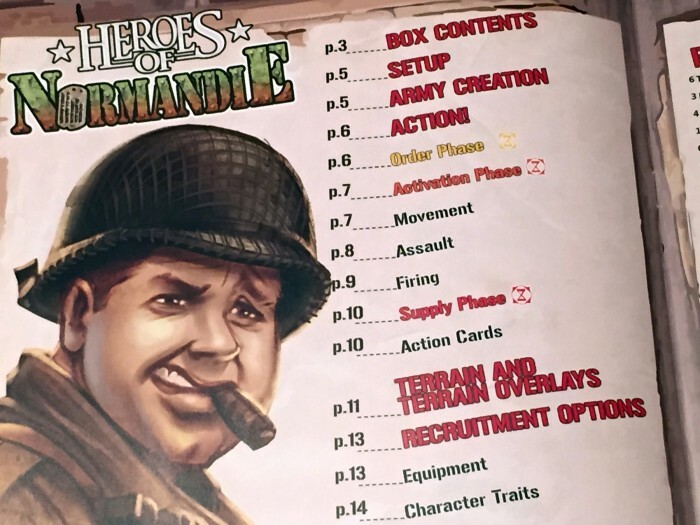 How do you not at least like a game that’s got Lee Marvin caricatures (inside)? 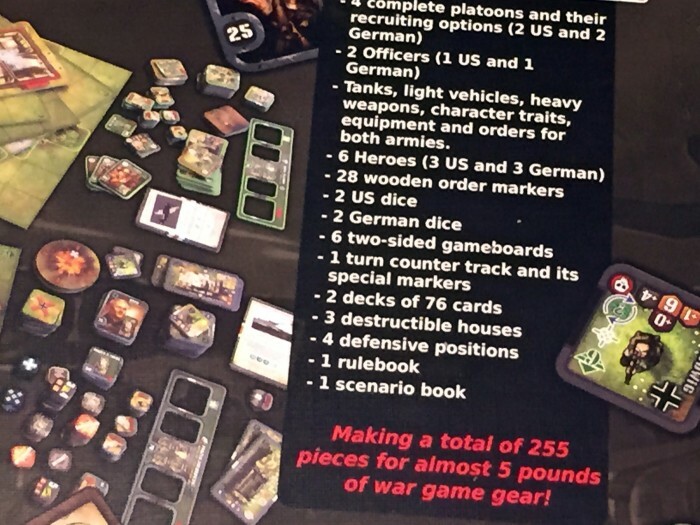 The game is not dainty and it’s not every offering that brags about how much it weighs. Not much less than my son when he came into the world. Once inside, there’s a 20-page, heavily-illustrated rule book and a scenario book that includes set pieces but what looks to be an extensive set of DIY instructions. The art style doesn’t stop on the outside. 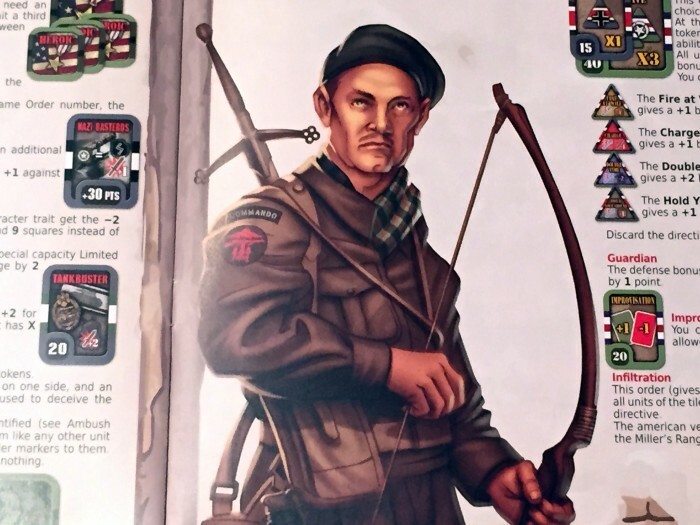 I can’t decide whether I liked Archie Bunker or the fellow with the claymore and longbow more. The scenarios, well presented, are all small actions, many of which tend towards the silly. Like this fairly well known one where your squad is sent in search of a general’s errant dog. Wise of them to include a rule that you can’t shoot the fool thing. Speaking of the counters, they come in really big sheets. Lots of really big sheets, although I gather the Kickstarter backers got even more depending on their donation level. Fortunately, my son enjoys punching out counter sheets. The sheets retain the graphic style discussed above, but I was very surprised at the level of historical detail that appears on the counters. I saw the Panzer Lehr logo at a distance and my groggy heart nigh skipped a bear. 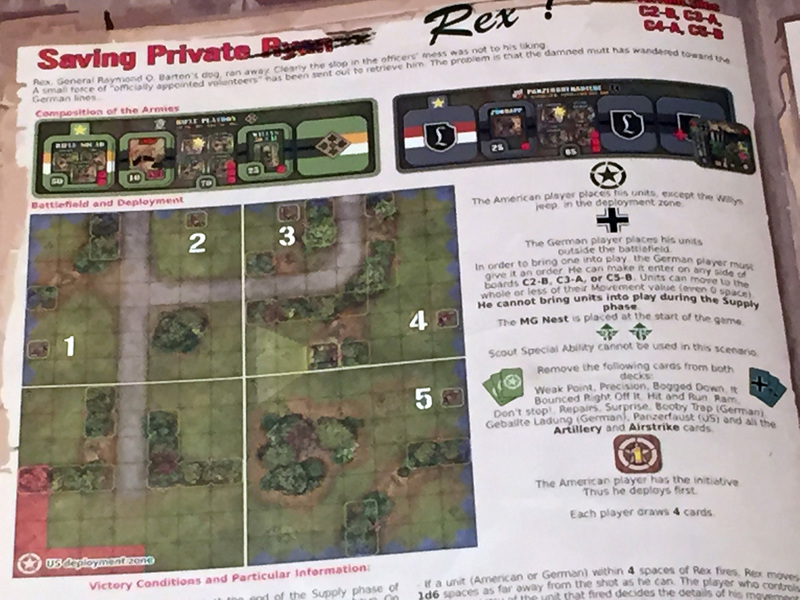 The counters are an interesting mix of historical units included by TO&E, vehicles, terrain pieces that can be laid over the map, and markers. 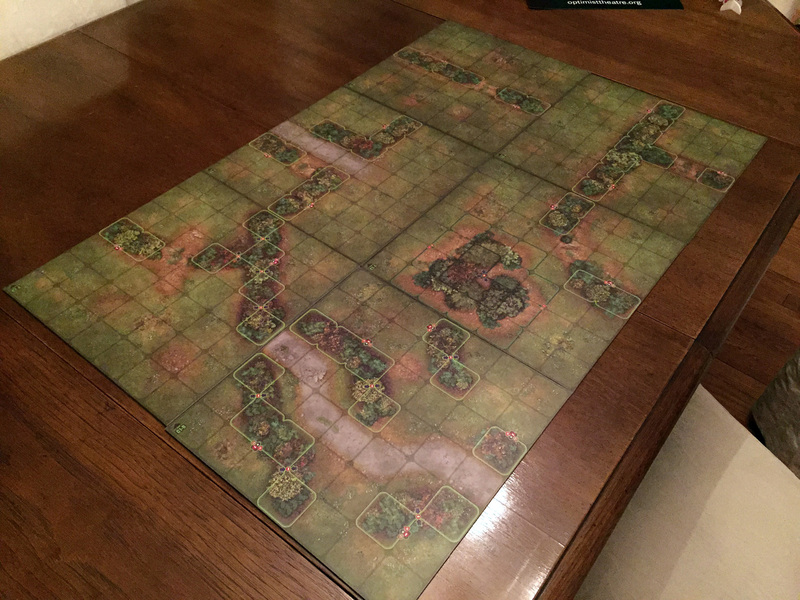 The six, double-sided map boards are mounted on very heavy stock. They came out of the box nice and flat and are evidently geomorphic. 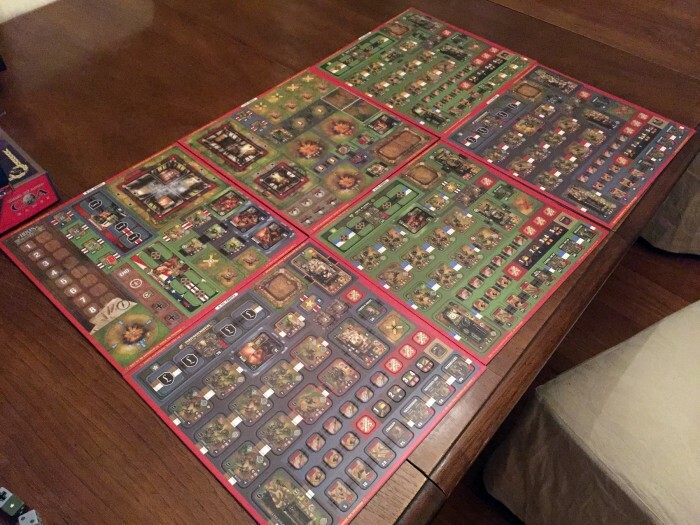 Between the counters and the map boards, the setup fairly well screams “room for expansion”. Covers a nice bit of space. The boards are divided into a square grid and terrain elements have their modifiers pre-printed. This will mean more once the rules are read, I’m sure. 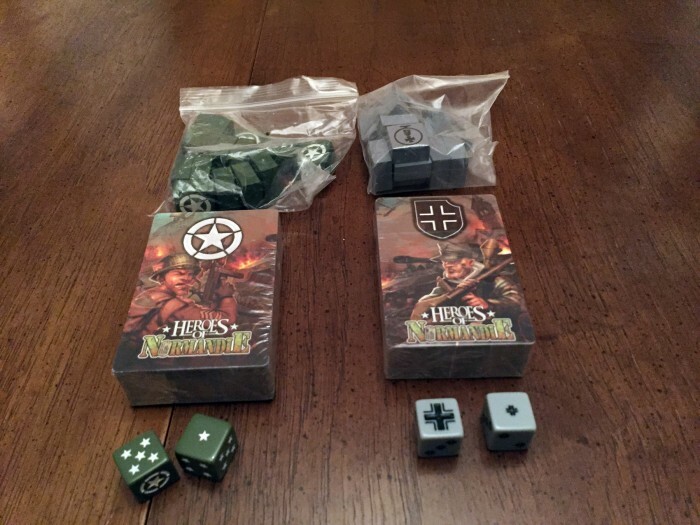 In addition to all the above goodness, the game comes with two packs of cards, order markers for both teams, and set of side-specific dice. I give huge points for the pips being stars for the Allies and Balkenkrueze for the Germans. Hands up, how many people knew what a Balkenkrueze is? 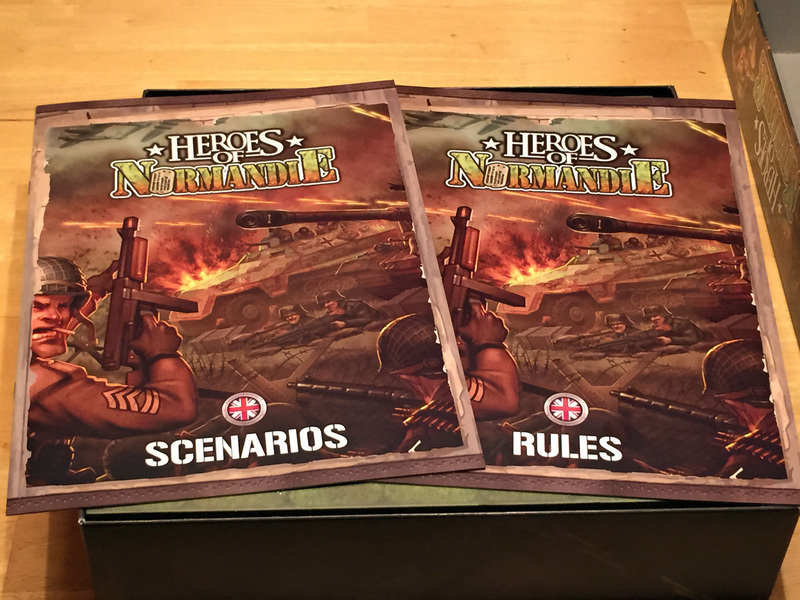 That’s all for now, but watch this space for a review of “Heroes of Normandie” in the near future. See you in the hedgerows! One Response to Heroes of Normandie – First Look! 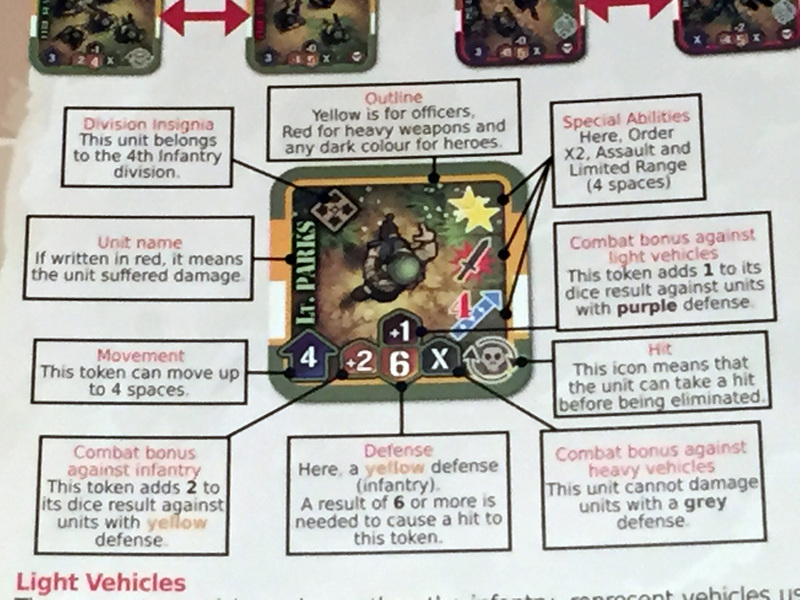 I recommend punching the counters, printing the revised rules from the DPG website and playing the game. It is not serious, but I found it to be seriously fun to play.